WRTD recently acquired several longer buses for their fixed routes. 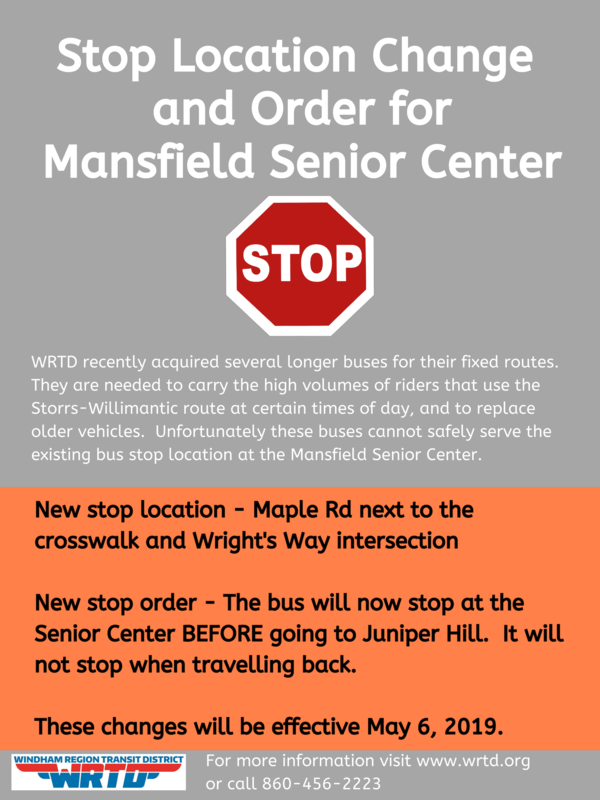 Unfortunately these buses cannot safely serve the existing bus stop location at the Mansfield Senior Center. 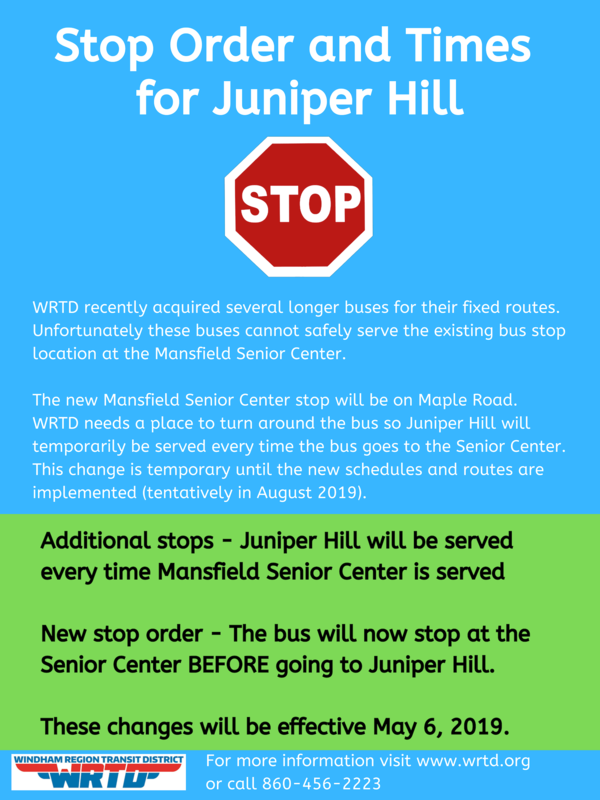 For more information, please refer to our bus posters – Mansfield Senior Center and Juniper Hill. Due to the heavy snow, Dial-A-Ride and all WRTD routes except Route 32 will have a delayed start on Monday, March 4, 2019. All routes will begin at 9:00 AM. Route 32 will run the regular schedule, but expect delays. Danielson will begin its morning run at 9am. Download the Ride Systems app or visit www.wrtrdtracker.com to track our routes in real-time. WRTD will be implementing new fares on Monday, May 6, 2019. This move follows a period of public outreach and comment period in January 2019. The biggest change is the introduction of the new Ten Punch Pass. This one pass can be used for fixed routes, Dial-A-Ride and ADA, providing significant discounts and flexibility for riders. 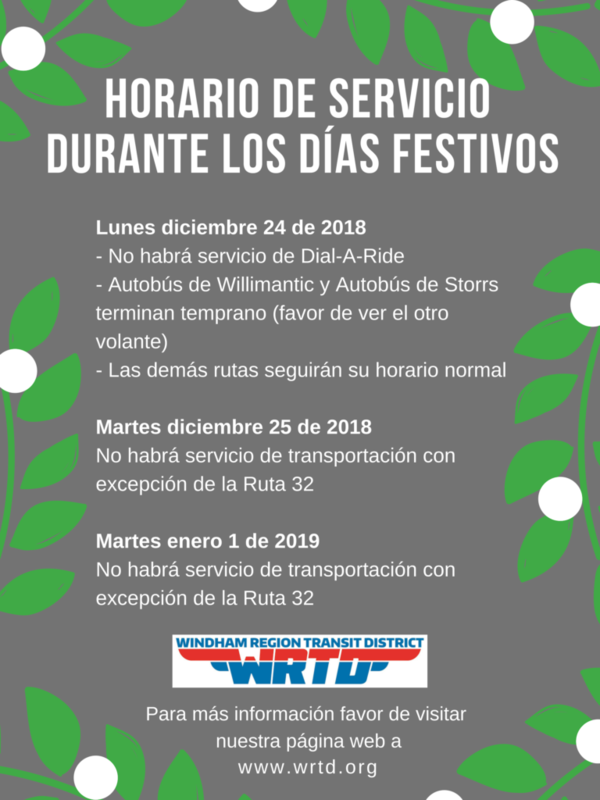 La Región Distrital de Tránsito de la Región de Windham (WRTD, por sus siglas en inglés) implementará nuevas tarifas el lunes, 6 de mayo de 2019. Esta decisión viene después de un periodo de consulta pública y comentarios en enero de 2019. El cambio más grande es la presentación del Pase de Diez Perforaciones. Este pase puede ser usado en rutas fijas, Dial-A-Ride y ADA, proveyendo descuentos significativos y flexibilidad para los usuarios. Más detalles sobre las nuevas tarifas y pases serán publicados en el transcurso del siguiente mes en www.wrtd.org/fares, a través de la lista de WRTD, Facebook, Twitter y otras fuentes. La información pueden enviarse correo si lo requiere. Si tiene preguntas, por favor escriba un correo a info@wrtd.org o llame al 860-456-2223. WRTD buses will continue running for as long as we can during winter storms. If we need to alter service we will post information about stopping and re-starting service on twitter, facebook, the bus tracker website, on WILI radio, TV Channel 3, the bus tracker app (Ride Systems). Stay safe out there! 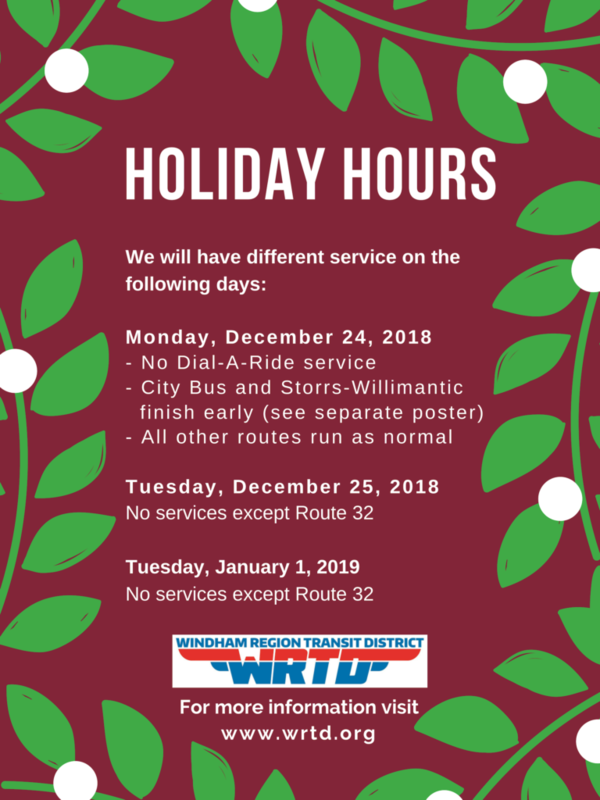 The Windham Region Transit District (WRTD) will conduct a public hearing on Tuesday, January 22, 2019 at the Windham Town Hall Auditorium, 979 Main St, Willimantic, CT from 2:00 PM until 3:00 PM regarding proposed fare adjustments to be implemented no earlier than April 1, 2019. Details about proposed fares are available online at www.wrtd.org and can be mailed upon request. Deaf, hearing impaired or persons with limited English proficiency wishing to attend this hearing and requiring an interpreter must notify WRTD by no later than 5pm on Thursday, January 17, 2019. El Distrito de Tránsito de la Región de Windham (WRTD, por sus siglas en inglés) llevará a cabo una audiencia pública el 22 de enero de 2019 en el Auditorio del Ayuntamiento de Windham, 979 Main St, Willimantic, CT, de 2:00 p.m. a 3:00 p.m. con referencia a los ajustes de las tarifas propuestas a ser implementadas no antes del 1 de abril de 2019. Los detalles sobre las tarifas propuestas están disponibles en línea en www.wrtd.org y se pueden enviar por correo bajo petición. Las personas sordas, con problemas de audición o con dominio limitado del inglés que deseen asistir a esta audiencia y que requieran un intérprete deben notificar a WRTD antes de las 5 p.m. del jueves 17 de enero de 2019. 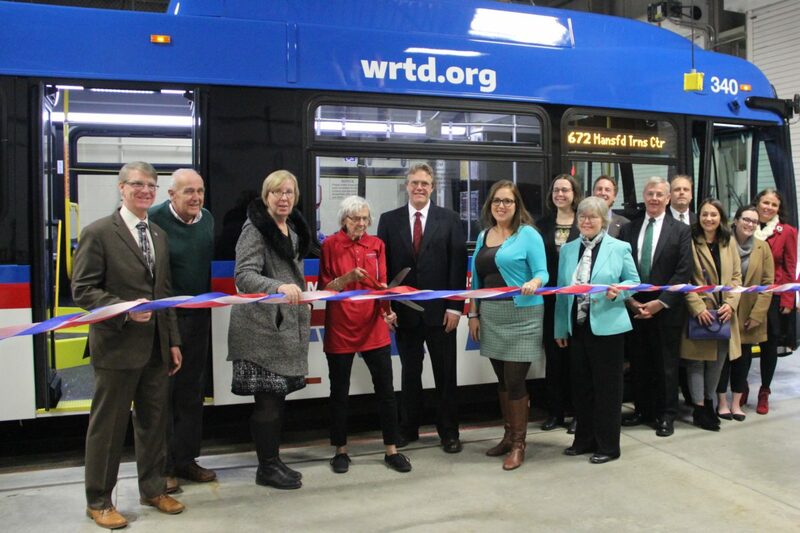 WRTD celebrates new buses and era! 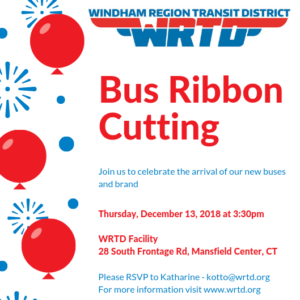 On Thursday, December 13, 2018 Windham Region Transit District celebrated the arrival of two new 35ft long buses. These buses, purchased from New Flyer, will be used on several of WRTD’s fixed routes. WRTD also celebrated the arrival of a new logo and new era which is underway. 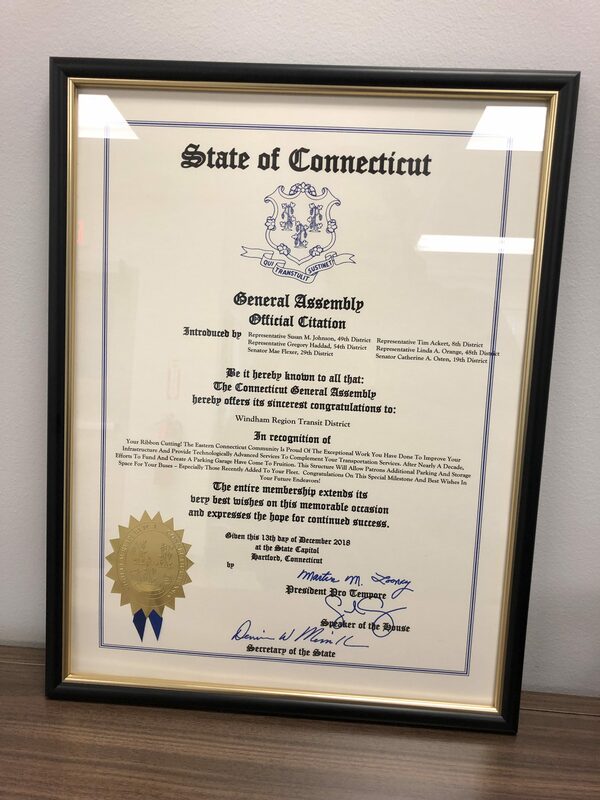 WRTD received congratulations from State of Connecticut’s General Assembly. The Official Citation was introduced by Representative Susan Johnson, Representative Gregory Haddad, Senator Mae Flexer, Representative Tim Ackert, Representative Linda Orange and Senator Catherine Osten. Click here to view the citation that recognizes the work WRTD has done. Below are a selection of photos from the event. Thank you all for attending and celebrating with us! Students – Remember to renew your U-Pass! WRTD is excited to announce the arrival of new buses in its fleet. 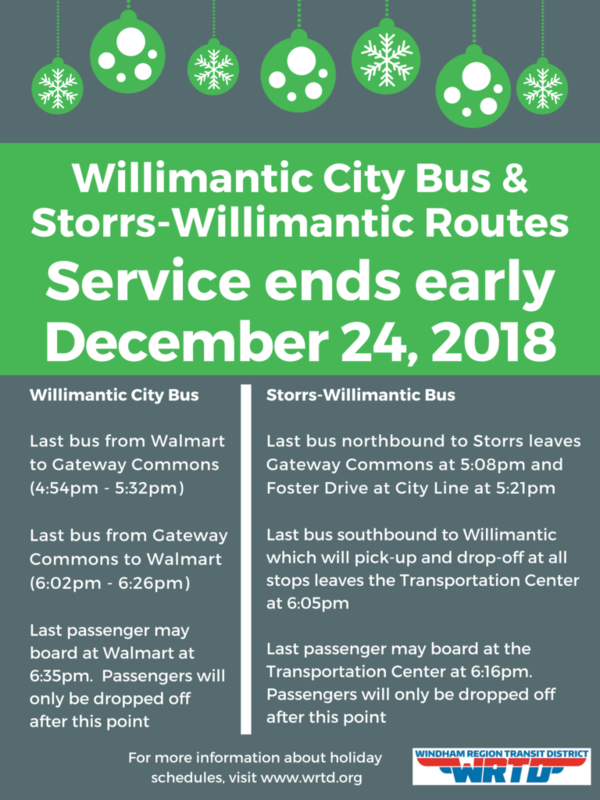 Several of WRTD’s fixed bus routes will benefit from the arrival of these buses, including popular Storrs-Willimantic route which had passengers making 84,000 trips last year. In August WRTD also finalized the design of a new logo. This new brand confirms the arrival of a new era which is already picking up pace at WRTD. Earlier in 2018 WRTD started using a bus tracker with a website and app for riders. WRTD also has a revitalized online presence on its website, facebook and twitter. Other plans are also in the works. All are invited. Please email Katharine to RSVP. For more information please visit our recent press release. THE RIBBON CUTTING EVENT HAS BEEN POSTPONED. Expect a new date to be announced soon. Sign up for our newsletter to receive event updates. Thanks! WRTD is excited to announce the arrival of two new buses in its fleet. 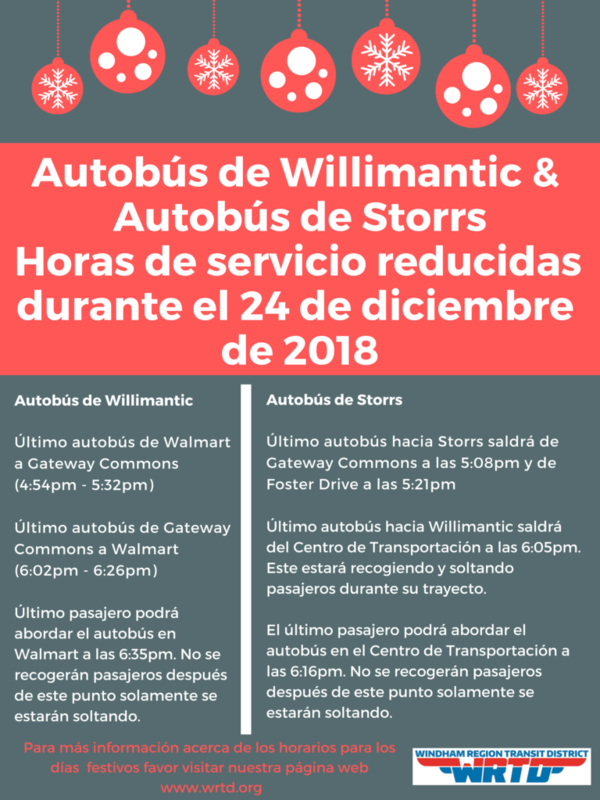 Several of WRTD’s fixed bus routes will benefit from the arrival of these buses, including popular Storrs-Willimantic route which had passengers making 84,000 trips last year. – The event will be held outdoors with the new buses, unless the weather is poor.